Its been a long week and its not over yet... I've been playing nurse to the others in the owlet nest and I'm hoping they'll all start to be on the mend soon. Aside from mending the rest of the family, I've been working on mending old nappies, but I'm dubious as to whether they'll hold up, so the enthusiasm has waned rather... I'd rather be playing with colour anyhow.... This is a custom Mini Mei Tai for a little one up north. I was lucky enough to hold her as a newborn and now she's big enough to carry her own babies around!! Where did that time go? Go and hang out among the creative peeps at Kirsty's. I love the fabric with the little birdies on! Very cute! Good luck with your machine - mine seems to have 'off days' when needles and thread constantly snaps! I guess just like we have bad days too! Hope everyone is feeling better! I hope everyone is on the mend soon. I love all your fabric choices here, the sling will look gorgeous! I am ridiculously excited :) Here's hoping the spring breezes bring health and healing to your home. Gorgeous fabric! what a great colour combination. I love th fabrics you are using. Yes, the time does seem to fly by. Lots of mending for you, and I hope all of it goes smoothly. 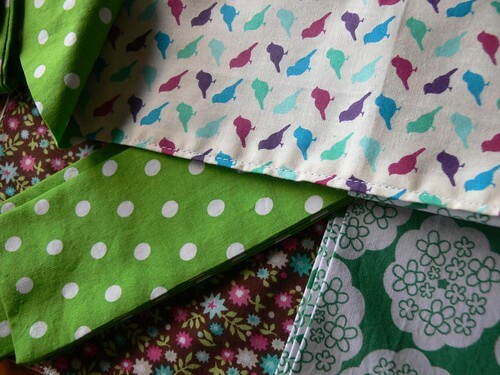 Great-looking fabrics! I had a needle-snapping episode a while back, I just went for a larger/stronger needle. I have a local contact who does a good machine service (for much less than usual) if you want his details, let me know. I hope you are all better soon.